For most sequels, the lineage is very easy to trace -- there was a movie and now there's another movie. Not so for Mamma Mia! Here We Go Again. First, there was a stage musical, Mamma Mia!, which premiered in 1999. This combined the music of Swedish group Abba with a story set in the Greek isles. The play was adapted into a movie of the same name, which was released in 2008. With the success of that film and the continued allegiance to the stage production, we now get another movie, Mamma Mia! Here We Go Again. Does this one finally shed some light on how Abba's music wound up in this story? Mamma Mia! Here We Go Again plays as both a sequel and a prequel to Mamma Mia! (as if things weren't confusing enough). The main story takes place some time after the events of the first film. Donna (Meryl Streep) is dead and it's up to her daughter, Sophie (Amanda Seyfried), to plan the grand-re-opening of the small hotel which Donna founded on a tiny Greek island. Donna gets help from Sam (Pierce Brosnan), whom she considers to be one of her "three dads", and a local gentleman named Fernando (Andy Garcia). While all of this is happening, we see the story of how a young Donna (Lily James) came to throw off the shackles of her Oxford education and run away to Greece, along with her two best friends, Rosie (Alexa Davies) and Tanya (Jessica Keenan Wynn). We also see how she met Sam (Jeremy Irvine), Bill (Josh Dylan), and Harry (Hugh Skinner). The stage production of Mamma Mia! is the kind of thing which is often called a "crowd pleaser" and the same could certainly be said of the 2008 feature film. That movie wrapped up its story quite nicely and everyone went away happy. This sequel which appeared a decade later was clearly made for the fans who can't get enough of the cheery spectacle seen in the first movie. (I seriously doubt that anyone was losing sleep wondering what Donna was like in her twenties.) In many ways, Mamma Mia! Here We Go Again is nearly a carbon copy of the first movie, as it features a similar story structure, the same characters, and some of the same songs. And this is where those who aren't super-fans will find the sequel unappealing. I saw Mamma Mia!, thought that it was OK, and moved on. Despite having many of the same elements as the first film, Mamma Mia! Here We Go Again feels like a pale imitation and never musters the sense of fun and enthusiasm which the original generated. 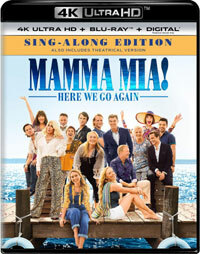 As for the music, as noted above, some songs like Dancing Queen and Mamma Mia are repeated from the first movie. Some of the others are less familiar. I'm not an Abba completist, but I grew up in the time when they were dominating the radio and there were some songs here that I'd never heard. (In the extra features included here, the actors admit that they weren't familiar with some of the songs.) They should have called this movie Mamma Mia! Deep Cuts. So, the verdict is rather simple. If you loved Mamma Mia!, then you will most likely find something cherish with the sequel. As for everyone else, you will be presented with a movie which brings nothing new. The one truly positive thing about Mamma Mia! Here We Go Again is that it contains very little Meryl Streep. Mamma Mia! Here We Go Again makes traveling the world look very easy on 4K UHD courtesy of Universal Studios Home Entertainment. The film has been letterboxed at 2.35:1 and the Disc contains an HEVC 2160p transfer which runs at an average of 40 Mbps. The image is very sharp and clear, showing no notable grain and no defects from the source materials. The colors look very good, most notably the blues, and the image is never overly dark or bright. The level of detail here is excellent, as we can make out textures on objects, and the depth works very well. The Disc carries a Dolby Atmos audio track which runs at 48 kHz and an average of 3.5 Mbps. The track provides clear dialogue and sound effects. Obviously, the songs are the stars there and they sound great, as the music and vocals fill the speakers, providing nice surround effects and a good source of bass action. Outside the music, the dialogue is always clear and some exterior scenes deliver obvious surround and stereo effects. The Mamma Mia! Here We Go Again 4K UHD contains an amazing amount of extra features. We begin with an AUDIO COMMENTARY from Director/Writer Ol Parker. This is followed by a second COMMENTARY from Producer Judy Craymer. The Disc offers four DELETED/EXTENDED SONGS AND SCENES which can be viewed with commentary from Parker. These amount to one deleted scene and one deleted song ("I Wonder"), and two extended songs. "High Jinks" is a one-minute gag reel. "Enhanced Sing-Alongs" (47 minutes) offers 18 songs with large on-screen lyrics. "The Story" (6 minutes) is an interview with Craymer who discussed the history of the musical and the films (although I still don't know where the story came from). "Mamma Mia! Reunited" (4 minutes) has the cast and Parker discussing their views on making a sequel. "Playing Donna" (2 minutes) has James and Streep talking about their approach to the character. Seyfried talks about re-visiting her character in "Sophie's Story" (4 minutes). "Meeting Cher" (4 minutes) has the icon talking about her involvement in the movie, and includes comments from her. "Costumes and The Dynamos" (5 minutes) has Costume Designer Michele Clapton pointing out the film's specific looks. "Choreographing Mamma Mia! Here We Go Again" (7 minutes) offers Anthony Van Laast a change to dance around the subject. "Cast Meets Cast" has the young and old Tanya and Rosie getting together to talk about their characters. "Curtain Call" (4 minutes) takes us on-set to see how the finale was created. Similarly, we get an inside look at the planning which went into "Dancing Queen: Anatomy of a Scene" (3 minutes). "Cast Chats" offers separate sit-downs with the main female characters and then the main males. "Performing For Legends" (3 minutes) takes us into the studio to see the songs being recorded. "Class of '79" (4 minutes) shows how the younger actors attempted to mimic their older counterparts. "Today Interview with Cher & Judy Craymer" (5 minutes) is conducted by Kathie Lee Griffin.